Let's begin with a little bit of your visual arts background and how you began working on your recent drawing project, Shuttered. I attended the University of Illinois at Urbana-Champaign where I earned a dual BFA in painting and art education. While I was there, I enjoyed that I was able to take a wide array of classes and explore many of my other interests in addition to art, particularly psychology, which has always played a role in my work. Specifically, I was interested in capturing the intense psychological complexity of ordinary, everyday, domestic life through figurative painting. During my last semester, I studied abroad at Camberwell College of Art in London, completing my education in 2009. Since graduating, I continued to use the language of figurative realism, creating dramatic and sometimes mystical self-portraits that were imaginative explorations of everyday life. Eventually, I turned my focus outward and began to explore the lives of those around me. The first seedlings of my series What was Once a Home can be seen in an earlier series entitled Perception of What May Not Be. This small series comprised painted illustrations based on accounts of hallucinations that I was reading about in Dr. Oliver Sack's recent book Hallucinations. One account was by a man with who was suffering from visual hallucinations as a result of delirium tremens. He looked out of his window and saw the landscape before him continuously disappearing and reappearing. To recreate this, I photographed an alleyway very close to my apartment, which I then painted with shrouds of mist, giving the illusion that parts of the landscape were disappearing. This was my first painting that was architectural in nature, and I found that I thoroughly enjoyed creating it. After that, I felt like my eyes were open in a new way, and I began taking notice of the architecture around me in my daily life. I created another painting shortly after that, which was essentially a parking lot in an industrial part of the city, and as I created this piece, I found myself becoming interested in architectural decay that hides in plain sight. With this new interest, it didn't take me long to make the connection with abandoned buildings, and ultimately abandoned, foreclosed homes. These structures particularly stood out to me because of their layers of history, along with their social significance as markers of a culture of inequality. How do you choose a home to draw for your project? What captivates you about these specific buildings? What I find captivating about these specific buildings can be found in most boarded-up, foreclosed, neglected buildings in the city. Most of the houses I've drawn are from the south side of Chicago, and in some areas with a high prevalence of foreclosures, these houses seem to have no end in sight. Each and every house is so striking and captivating, each telling so many stories, the most recent of which are no doubt heartbreaking or gut-wrenching. In terms of the specific buildings, I think the beauty is in the details, which is why I chose to create such highly detailed, realistic drawings. Whether it's the old icicle Christmas lights, telling a story of warmth and celebration, or the broken shards of glass on a second floor window, telling another story of neglect and decay. Each detail is so moving and tells a story of the human lives that have surrounded these structures. Are most of the works in the exhibition at the Elephant Room Gallery featuring drawings that were made during the winter season? Do you ever depict these buildings in the spring or summer? I haven't depicted any houses in the spring or summer, and I think that would change the feel of the work in an interesting way. For this series, I focused on the winter. I think there is something about the sense of quiet in the winter that helps to create a melancholy and contemplative mood in each piece. Also, the snow and barren trees clear the viewing field so that it is easier to see and focus on the houses, along with the equally haunting empty space surrounding many of the houses. Can you discuss the decision to use toned paper for the drawings? The decision to use toned paper came along with the decision to make drawings instead of paintings, which I had been doing exclusively prior to this series. When I set forth to create these images, I knew that I wanted to express how ephemeral they were. I wanted to create an image that would be evocative of a memory, something that seems as though it is fading away at this very moment, which I thought the medium of drawing would capture best. 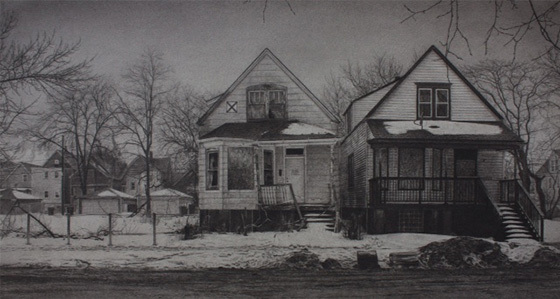 The dusty black of a carbon pencil also helped to highlight the stark and haunting nature of these scenes. I chose to use toned paper because with the monochromatic nature of the carbon pencil, I wanted each drawing to have a unique feel. 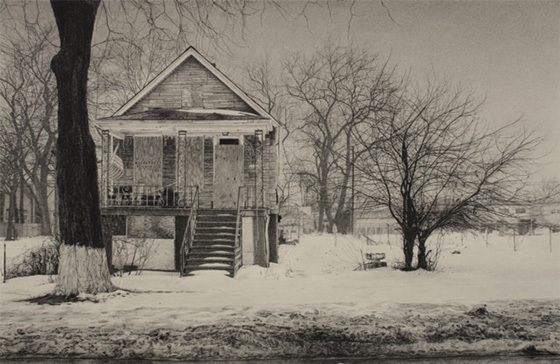 I originally envisioned these images as portraits of houses, which I will talk about more in the next question, but with that in mind, I chose a paper that could contribute to the mood and character of each house, and allow the viewer to see each of them in a unique light. You have previously worked on portraits--is drawing a house similar to a portrait? 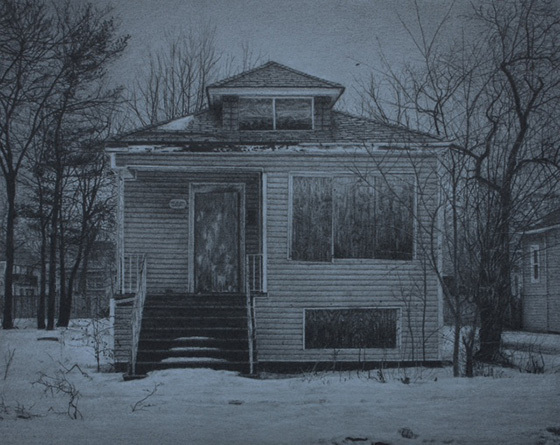 I have found drawing a house to be very similar to drawing a portrait. A human face is beautiful for all of its details. The wrinkles around someone's eyes can tell a story in a similar way that peeling paint or a broken window can. When I began this series, it was originally called Portrait of What was Once a Home, which I eventually shortened to What was Once a Home. But that is actually how I envisioned this series, with each house being a portrait that told a larger story about its life and everything it has seen. Can you tell us a little bit about where you plan on going with Shuttered in the future? Do you imagine that you will continue with the project? To be completely honest, I don't know the answer to that question yet. It's something that I have been thinking about a lot. I'm planning on taking a bit of time after this show to reflect upon my work and make some decisions about what's next. I know I'm going to continue to make work that documents the world around me, but that's about all I know at this time. The exhibition, Shuttered, will open Nov. 13 with a reception from 6:30 to 9pm at the Elephant Room Gallery, 704 S. Wabash Ave. The exhibition will be on view until Jan. 2, 2016.